Cynthia Meyers joined the Boston Symphony as piccolo in the autumn of 2006. Before coming to Boston, she served as the principal piccolo of the Houston Symphony for nine years under the direction of both Christoph Eshenbach and Hans Graf. 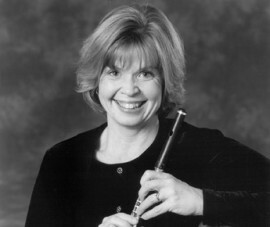 She is the former principal flutist of the Omaha Symphony, a post that she held for nine seasons. During her tenure in Omaha, she had been a featured soloist with the orchestra on numerous occasions. A native of Somerset, Pennsylvania, she began playing the piano at age 3. She earned her Bachelor of Fine Arts degree at Carnegie-Mellon University and finished her Master of Music at the Cleveland Institute of Music as a student of Jeffrey Khaner, principal flutist of the Philadelphia Orchestra. She took an interest in playing the piccolo while in Cleveland, and continued study solely on that instrument with William Hebert, of the Cleveland Orchestra. In addition to playing with the Symphony and teaching privately, Ms. Meyers has performed at the Grand Teton Music Festival with colleagues from other major orchestras around the country. She has also performed with the Minnesota Orchestra and the Chicago Symphony.